With Joe Thornton set to undergo additional evaluation on his injured right knee, as a Sharks spokesman toldreporters Thursday morning, San Jose will turn back the clock in their first game without the 38-year-old center on the top line Thursday night against the New York Rangers. Joe Pavelski skated on the first line, between Timo Meier and Mikkel Boedker, at the morning skate. Pavelski's mostly played on the wing over the last five seasons, but played center for the United States at the 2014 Sochi Olympics and at the 2016 World Cup of Hockey. He was also drafted as a center, and remains listed at the position on San Jose's roster. 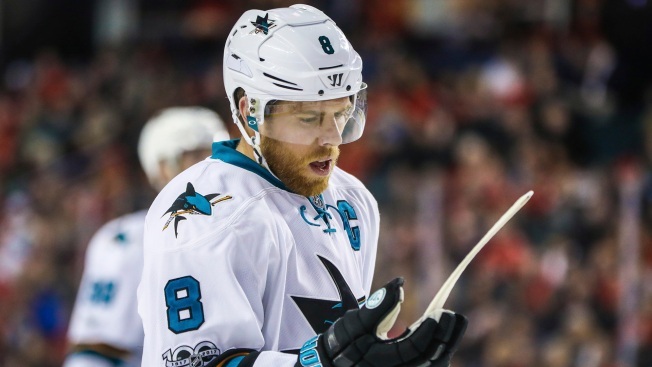 But functionally, Pavelski's been a winger for half a decade, and a great one at that: Only six players have scored more goals than Pavelski (155) since the beginning of the 2013-14 season. Given his track record, and that he's played the wing almost exclusively during Peter DeBoer's three seasons behind the Sharks bench, it would have been reasonable to expect Pavelski to stay there in Thornton's absence. Had the latter signed elsewhere this offseason, that probably still would have been the case. Plus, Tomas Hertl entered the season as a center with Thornton on the roster, and both DeBoer and general manager Doug Wilson have said they envision him playing the position long-term. So wouldn't it have made sense to move Pavelski to Logan Couture's wing, and Hertl back to center? Not exactly, at least based on Couture and Pavelski's results together under DeBoer. There sample isn't very significant, as Couture and Pavelski have only played about 128-and-a-half five-on-five minutes together over the last three seasons, but the duo has only controlled 51.3 percent of the shot attempts and exactly 50 percent of the scoring chances, according to Natural Stat Trick. The Sharks have also outscored opponents 9-3 in those minutes, which is much a testament to Pavelski and Couture's collective talent as it is the situations they've played together over the last three seasons. Their 128 five-on-five minutes together doesn't even represent five percent of either player's total ice time over the last three years, and those minutes consist almost entirely of shifts that overlapped and late-game situations where the Sharks either were chasing or preserving a lead. Hertl and Couture, meanwhile, have controlled 52.95 percent of the shot attempts and 52.30 percent of the scoring chances in over 436 five-on-five minutes together this season. They've been outscored 17-22, but that's likely because of an .891 on-ice save percentage compared to a .928 five-on-five save percentage when both players are off of the ice. They can't control their goaltender, but otherwise Couture and Hertl have been better together across a more representative sample than Couture and Pavelski. That's not to say that Couture and Pavelski can't achieve similar results together, but that there is some method to the madness of moving the captain back to center. The Sharks will learn how long the experiment needs to last before Thursday's tilt against the Rangers, and get a better idea of just how long turning back the clock can last after.